Under no circumstances eat in the touristy areas. You will get bad expensive food. Don't order sodas in restaurants.Wine is cheaper,or if not of legal age,ask for Une Carafe d'Eau. (carafe of tap water). What is your definition of inexpensive? Do you plan to have your large meal at night or at lunch? I know Paris pretty well so let me know and I will give you some suggestions. Try Egullet.com also,they have alot more on the subject. Yeah -- you're going to get unadventurous first-times to eat herring. Good luck. Though, The Hersh does make a good point that there are any number of decent bistros to be found where the unadventurous can get steak frites or roast chicken, while the more adventurous eat herring or tripe sausage (or frog's legs, though hopefully not Roger). Here's a fun list, from which I pick one suggestion at random because I like the name (tranlates as "the worried mother" and the owners' affection for tourists. La Mère Agitée is a back-street Paris bistro noted for its bonhomie and its punning cognomen. With a low-cost no-choice menu, it figures prominently in lists of recommended eateries. There's singing on Wednesday night and all week long there's a camaraderie among the out-of-towners who assume that they share a social impetus and a love of the honest peasant cuisine which is fast disappearing. The burly, shiny-headed host is an unashamed self-booster. "We French don't appreciate real food any more," he proclaims to the whole room. "No butter, no fat - and we want tiny portions. We're ruining our own country. It's the tourists that keep me in business." That is a great list but the only one where you may be able to get out under 25 EUROS is Le Domaine de LIntillac, but mostly duck is served there so good luck. I will look up some Bistros later today or tomorrow and post them, though most I know are on the same list as Waitman. These average about 30-40 euros per person not including any drinks. Under $25 for dinner in Paris is very difficult; even under 25 euros is difficult. It might be doable at lunch, in ordinary neighborhood places that have a lunch menu. Some such places will feed you very well indeed for not very much. I remember, for example, having lunch a couple of years ago at a place called Brasserie Solférino on Boulevard St. Germain in the 7th--a very ordinary clattery corner joint. Their lunch special for the day was a beautifully cooked duck breast with a green peppercorn sauce, with pommes forestières and a quarter litre of red wine (and I think a little green salad), and as I recall the bill amounted to less than twenty dollars. And it was good. And then you might have a sandwich at a café for dinner, and with the money you saved that day, splurge on dinner the next. Would I need reservations? Where is it? How did you like Bistro Flo? It is a favorite of my wife and me. We try to get there every trip to Paris as well as to La H'uitre (The Oyster in case my Francais is incorrect). Small but easily found restaurant with excellent oysters (per the name), clams and shrimp. My hubby and I went to Paris last year. We didn't need a reservation for L'Ardoise or Au pied cochon. Food at L'Ardoise is not expensive but delicious. I'm actually going to be in Paris at the end of next week. For the third year in a row I have been trying to get into L'astrance and, once again, have not been able to get a reservation. Part of the problem is my lack of flexibility-I am committed to several business meetings and do not have the option of lunch or a night different than when I am there. Still, this is a restaurant that I would like to have tried. Curiously, as the years have gone by and their fame has spread, their prices have also risen. Dramatically. More than likely I'll end up at L'atalier du Robuchon which I've been to before or his new "casual" restaurant. I am envious. We snagged an early afternoon lunch reservation at l'astrance two years ago on our first trip to Paris and it was everything it is cracked up to be. The room is extremely comfortable; the food was prepared perfectly; the wines (which I had asked the waiter to choose after I narrowed my preferences to the Languedoc region) were exquisite; and the service was warm and impeccable. Even then it was expensive, but overall I thought it a good value for the two-hour+ experience. We also found l'atelier du Robuchon to be a delightful eating experience. So many dishes to try; and only so much room in the stomach! We also had a great experience with the service there. I had selected a familiar, modestly priced wine; the waiter recommended another that he said was better, at a noticeably lower cost. It was better, and belied the notion that Parisians are difficult on Americans. Let us know how the new casual restaurant turns out. is the link to my comments about L'atalier about three weeks after it first opened in 1983. Although they now accept reservations for only the first seating it is a very real advantage that with one's willingness to wait you can still get in. I also understand that on weeknights now, often there will not be a line. I would note in my comments above from 2003 that the kitchen staff is dressed in black. Today, Maestro's kitchen staff (Fabio excepted) is dressed in black. A statement and a presence. Le Relais du Parc in late November started a "best of" menu faturing four dishes each from both Ducasse and Robuchon in their first collaboration. Gayot gives the "old" restaurant 15/20. Has anyone been to this since the addition of these dishes? Curiously, I had no difficulty booking a table for this Saturday, a night when seemingly ever place that I tried was closed. I would note in my comments above from 2003 that the kitchen staff [at L'Atelier de Joel Robuchon] is dressed in black. Today, Maestro's kitchen staff (Fabio excepted) is dressed in black. A statement and a presence. When I dined at L'Atelier in Vegas in October, they explained that Robuchon orders the black clothing because he wants the customers to focus on the food, not the chefs. Anyway, it's stylish. Black is the new black, as it were. Old style institution famous for their numbered pressed duck and magnificent view of Notre-Dame and Seine River. Don’t waste your time and money on this one. It’s very expensive for what you get. Tour D'Argent is now a one star restuarant. First meal in Paris at Entregeu on Rue Languier...Simple cuisine at extremely reasonable prices. Only an introduction to a week of culinary adventures!! Dinner at Atelier de Joel Robuchon. Opting for "no wait" I made reservations via email before leaving for Paris for dinner at 6:30pm. Given the fact that lunch at L'Entregeu ended after 2pm, we had very little time to digest, but the walk from Champs Elysees to the Quartier Latin helped us digest...ready for more!! Spending a few days in Paris next month and would love more recommendations in the low- to mid-priced range. Also, shops -- we'll be in an apartment and so we'll be able to prepare our own meals. The thread so far has some nice suggestions -- anyone got more? My favorite meal in Paris was at La Regalade (49 avenue Jean-Moulin, 75014 Paris (00 33 1 45 45 68 58) Closed Saturday lunch, Sunday, Monday). As you take your seat you are welcomed with a homemade terrine with cornichons...to die for...if I knew that they would later take it away when the appetizers were served, I would not have eaten it at a leisurely pace. The raw oysters were served with homemade sausage links, a new combination for me, but I SO SO SO hope that every restaurant that serves raw oysters would follow. We split a full order of pan seared foie gras, followed by a veal chop for two. Dinner concluded with to-die-for orange souffle and camembert. Dinner for two with 2 bottles of wine was around $130. Of the places we tried that I would recommend are: Le Meurice, L'Atelier de Joel Robuchon, Pinxo, Cafe Flore, Ze Kitchen Gallerie, Pierre Herme, Laduree, Le Pied de Cochon, Angelina's, and L'entregeu. If you are interested in any of them, PM me, l can email you pictures of our meals. Add L'Ardoise and L'Huitre and Bistro Flo and Le Pied de Cochon to that list...there's also a good Korean restaurant about 3 blocks from the Tuilleries behind the big glass building. A bad meal in Paris takes some doing. We just got back and once again enjoyed every day and meal. The best meal of my life is still rated as the multi course meal I had at Guy Savoy. It was also by far and away the most expensive. This was several years ago. We also tried La Tour d'Argent (was good, but not tremendous and the waiter warned us that the pressed duck was very very gamey, so we ordered off their tasting/sampling menu instead). The third haute restaurant we visited was Le Grand Véfour. The restaurant was very beautiful, but the meal was not as impressive as the history of the restaurant's past diners and the decor all around. For cheap eats I recommend L'Sargent Recruit near the latin quarter. Not sure if it is still around, but for around 25 Euros you got all the salad and deli meats you could eat in a basket (including pickles and so forth), soup, a decent meal, plus all you could drink house wine (not tremendous), and desert (their chocolate mousse was pretty good). It is all low key and not 5-star quality, but definitely a great bang for the buck considering. The miracle of my week in Paris is that I only gained two pounds. Lots of recommendations to make. We stuck mostly to midrange bistros but had a really excellent meal at a place called Les Fables de la Fontaine (131 St Dominique in the 7th), more or less by accident. We'd wanted to go to Cafe Constant, but it was closed for the week, and the sign on the door directed us to try Les Fables only a few doors down, as they're both Christian Constant's places. They were not thrilled that we didn't have reservations, but found us a table nonetheless. Place was packed within five minutes. Minimal decor, exposed brick, the focus is all on the food. The menu is very limited -- only what's on the chalkboard, maybe five choices per course, and ALL fish and seafood -- but delicious. I don't know what merlu is, but it's some kind of mild white fish and it is stellar. My fish also came with a rich pasta gratin and my companion's came with a tomato/eggplant/mozzarella side. The bread is served with an addictive crabmeat spread. Two kirs, two apps, two entrees, and 50cl of wine came to about 120 Euro. I definitely recommend reservations, as it is small. Cheaper, and with a much wider selection, was Le Comptoir (9 carrefour de l'Odéon, in the 6th.) My research and guidebook both indicated that Le Comptoir only offers a 40 Euro prix fixe menu in the evenings, but it is not so. We ordered off the menu, and what a lovely menu it was. Very warm service. My lobster bisque was a tad fishy but my seared tuna with tapenade, pistou, and roasted vegetables was flawlessly done. And the best part: a five-cheese plate from Fromagerie Boursault, for a mere 8 Euro. I think this came to 140 Euro for three people, three courses each, including wine. They do not take reservations, try getting there no later than 7:30. Speaking of cheese, I was sadly thwarted by vacations (Barthelemy) and fromageries that weren't located at the address I had for them (Quatrehommes) but I still managed to eat my fill. At La Grande Epicerie we picked up morbier au lait cru, beaufort au lait cru, a German cheese with bacon in it, and chevre rolled in hazelnuts. All were excellent. We also picked up some bread and meat and made a picnic of it in the nearby Jardin du Babylone. Also got a nice artisinal bleu and a camembert affinee in some type of alcohol -- maybe armagnac, maybe Calvados -- at the Cremerie de Carmes (47 boulevard St-Germain in the 5th.) Both were insanely strong, but great in small doses. Foodie gifts for the family were picked up at L'Epicerie, 51 rue St-Louis-en-L'Île. Seriously, Wall O' Mustard. Do not miss. 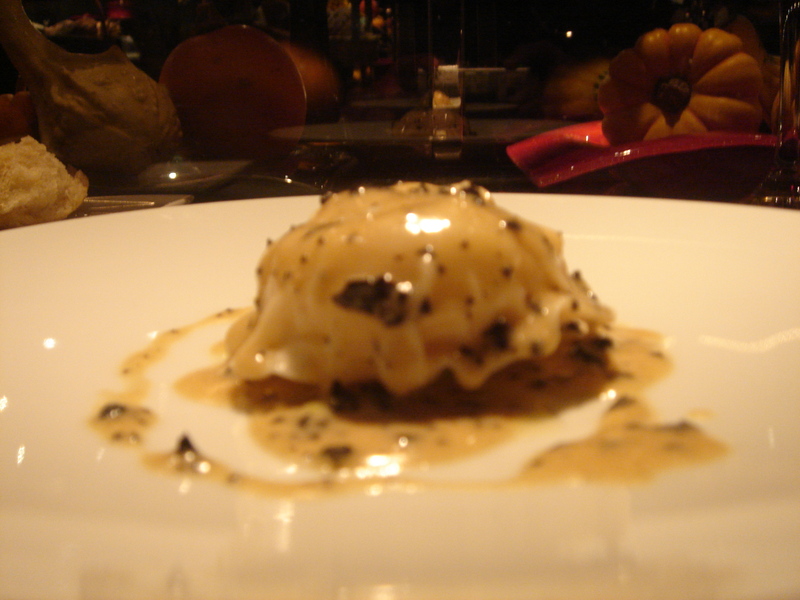 Mustard with cognac, with truffles, with shallots, with champagne, with cream, with various combinations thereof. Also many jams, cocoas, vinegars, and peppercorns. Last but not least: after our midafternoon picnic we stopped for tea and pastries at Laduree (16, Rue Royale). I had an espresso, companion had a smoked tea. We shared four mini-macaroons with pistachio ice cream, and a treat I couldn't resist, as I've always wondered what they're like: a Gateau St. Honore. Traditionally this would involve pastry cream on puff pastry with a ring of profiteroles around the outside. Laduree's special version includes raspberry puree and a pastry cream flavored with rose. Not a bargain at 25 Euro for the meal, but worth every penny. The bit about hiding the cellar (a quarter-million bottles?!) during WW2 is simply fascinating. Can you imagine what the post-liberation celebration must have been like? Why not? We had some very nice Oregon Pinot in Paris and it wasn't that expensive. LaVinia in Paris carries a large selection of American wines at reasonable prices (not as reasonable as French wines but what would you expect?). I was in the LaVinia on Rue de la Madeleine last month. I was quite impressed with their selection. Prices were as expected. We spend way too much time there when we're in Paris. Thanks Don for moving this. I wanted to get out of Nadia's forum. You should look for the book published fairly recently called "Wine and War" by the Kladstrups. It details the efforts to save the wine of vignerons and restaurateurs all over France during the war including La Tour d'Argent. Fascinating book full of things they don't teach in school. The Kladstrups have started a Wine and War tour around France, too.